Webcam Vöhl: Haus Ingrid - View from the holiday appartment 'Haus Ingrid' towards Ederberge and National Park Kellerwald-Edersee. Waldeck: PANOMAX Waldeck am Edersee, 4.8 mi. Waldeck: Waldeck Castle, 4.8 mi. Korbach: Pedestrian Area, 5.5 mi. Lichtenfels (Hesse): Lichtenfels Castle, View E/ESE/SE, 7.7 mi. Bad Wildungen: Kurschattenbrunnen, 9.8 mi. Heringhausen (Diemelsee): View of the Diemelsee, 14.3 mi. Hallenberg: View over Hallenberg, 15.5 mi. Willingen (Upland): View over Willingen (Upland), 15.6 mi. 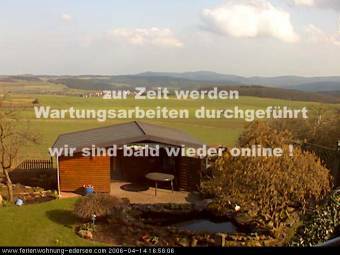 This webcam Vöhl with the theme Landscapes was added on November 23, 2006 and is operated by Haus Ingrid. It got 13455 visitors since then. Shouldn't this webcam work or should the link be wrong please report that here. You can add this webcam here to myCams. Here we have a list of places in Germany with webcams nearby.